The event will bring together all the members of our group who are foreign residents in and around Barcelona, who share a passion for the mountains, who want to get to know the surrounding areas and who want to meet others who share similar interests. You also can participate if you are Spanish an English and/or French spoken. We have more than 25 countries represented in the group and we believe the CAB is a very valuable meeting place for our growing international community, especially those who want to pursue their passion for the mountains together. We have members from France, Italy, Norway, Germany, England, United States, Argentina, Chile, Netherlands, Russia, Poland, Portugal, Brazil… and this makes us one of the most diverse and international Clubs in Barcelona. For this reason, CAB has joined forces with the IMC (the International Mountain Community) who act as a platform to promote mountain events and activities with foreign residents across many cities in Europe. On the 10th of November we’ve put together an excellent trekking event in the Osona region not far from Barcelona. 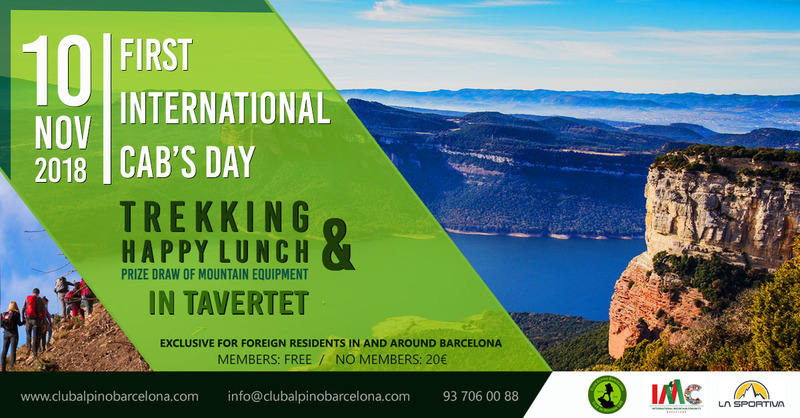 We will enjoy a great day of trekking and then enjoy a fun lunch together and a prize draw of mountain equipment. The event is FREE for CAB members and has a cost of 20€ for non-members which includes mountain insurance. Cingles de Tavertet is one of the least known regions in the heart of Catalonia, in the Osona region and will surprise anyone who’s not travelled to these remote mountain areas. The Cingles de Tavertet are part of the Collsacabra natural region which is 142 square kilometers and belongs predominantly to the Osona region (although it also stretches into the neighboring areas of La Garrotxa and La Selva).It’s located between the Serralada Prelitoral and the Serralada Transversal Catalans, on a high plateau with crags or “cingles” in the South and the East. It has an average height of 1,100 meters and is made up of sedimentary rocks (margas and sandstone). The Tavertet Cingles are referred to as a “neutral territory” between the Guilleries and the Collsacabra. Difficulty: Easy hiking, 16 Kms, 700 meters of vertical gain, approximately 4-5 hours duration.